The German online roleplaying game Nine Kingdoms (Neun Reiche) consistently provides high quality castle-themed creations of all sorts, from standard to quite unique. 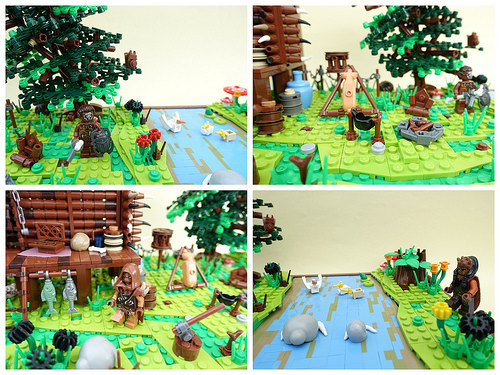 This build by Patrick B. is somewhere in between, containing basic village life elements, but in the shape of an orc settlement, which is not your everyday castle creation. Somehow, Patrick has managed to make lime green look like grass, which is nearly impossible. Combined with light green, it gives a very unique look to the diorama. There are a lot of clever uses of parts like large figure and minifigure hair pieces as stones and gears as flowers. 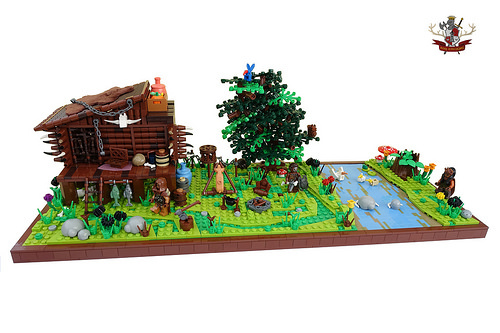 The hut has some exotic elements as well, most notably some scala parts and a DUPLO bearskin. It looks perfect and I think I would not need orcs strolling around it to know they lived there.